Discuss about the Business Law for Consolidated Business Acts. 1. In the present case, Dodgy Pty Ltd was the owner of café and he was to sell this café to Bill and Jill. He stated certain facts about regarding the business which led Bill and Jill into entering the sale contract. Here, we analyze the laws of business that can help Bill and Jill. As per section 19 of the Minors (Property and Contracts) Act, 1970, when a minor contributes in a civil act and at the time of such contribution by minor, the civil act was carried is for the benefit of such minor, then such act is binding on the minor. Section 8 of this act defines that an individual who is under the age of 18 years, is a minor (Australasian Legal Information Institute, 2016). Through various sections of this act and the common laws, a minor is held as eligible to enter into a contract regarding sale or purchase of property and regarding provisions of service and employment. When a sale of a business takes place in NSW, the Property, Stocks and Business Agents Regulations, 2014 are applicable on such business (NSW legislation, 2016). As per the Australian Contract Law, when a contract is made between two parties and one party misrepresents the facts of the dealing, than it is the case of misrepresentation. This phenomenon was established in various cases including the case of Bisset v Wilkinson  AC 177, Smith v Land & House Property Corp (1884) 28 Ch D 7 and Edgington v Fitzmaurice (1885) 29 Ch D 459. Moreover, when the facts have been falsified with the aim of getting the non breaching party to enter into the contract, it is it case of misrepresentation as was seen in the case of Museprime Properties v Adhill Properties  36 EG 114. Further cases like, Horsfall v Thomas  1 H&C 90 and Redgrave v Hurd (1881) 20 Ch D 1 establish when misrepresentation had induced the other party to enter into the contract (LawTeacher, 2016). Such misrepresentation results in a breach of contract and remedies in form of damages are available with the aggrieved party (Andrews, 2015). Here, Bill is a minor and entered into a contract, along with his sister Jill, for purchase of a cafe. This contract was legal and enforceable as the legislatures of NSW consider a contract by a minor as legal and binding. This has been established in the case of Nash v Inman  2 KB 1 (Australian Contract Law, 2010). The cases like McLaughlin v Darcy (1918) 18 SR (NSW) 585 and Chaplin v Leslie Frewin (Publishers) Ltd  Ch 71 further affirm the position that minors can enter into enforceable contracts. Further, this contract was for the benefit of Bill and so legally enforceable. In case of Homestake Gold of Australia Ltd v Peninsula Gold Pty Ltd  NSWSC 116, the benefit was not established and so the minor was not held liable (Latimer, 2012). Upon running the business, Bill and Jill found that the facts stated by Dodgy Pty. Ltd. were false and a misrepresentation was made in this case (Fair Trading, 2016). Also, a misleading and deceptive conduct under Trade Practices Act is also present in this, as established in the case of Yorke v Lucas (1985) 158 CLR 661. To conclude, Bill and Jill are liable to monetary damages as provided in Civil Liability Act 2002 (Australasian Legal Information Institute, 2016). Further, this misrepresentation gives Bill and Jill the power to terminate the contract as misrepresentation makes a contract voidable at the instance of aggrieved party. 2. In the present case, Hugh had falsely certain facts. Through the various applicable laws, an understanding has been drawn regarding the legal actions and remedies available to the aggrieved party. Any food industry in the region of New South Wales has to follow the provisions of the Food Act 2003 (NSW), Food Regulation 2015 and Australia New Zealand Food Standards Code (FSANZ). The objects of Food Act 2003 (NSW) comprise the following: to make certain that the food for sale is secure and suitable for consumption of humans; to prevent any deceptive demeanor in relation to sale of food; and lastly, to present the application of the Food Standards Code. The Food Regulation 2015 contains various regulations to ensure that the objectives of the Act are met with (NSW legislation, 2016). The standards established in the FSANZ are legislative instruments under the Legislation Act 2003. The objectives of FSANZ are same as that of the Act (Food Standards, 2016). Further, there are legislations that are relevant to food and promotion and packaging which are enforced by various bureaus. These include the Trade Practices Act 1974 (Cwlth) which is enforced by the Australian Competition and Consumer Commission; the Fair Trading Act 1987 (NSW) enforceable by the NSW Fair Trading; and lastly, the weights and measures are enforced by the National Measurement Institute (Department of Primary Industries Food Authority, 2016). The Australian Consumer Law deals with the unfair practices including deceptive or misleading conduct, unfair contracts and unconscionable conduct, product safety and information, product liability (Coorey, 2015). Section 18 of ACL prohibits such conduct by businesses which is deceptive or misleading or is likely to result in deception or misleads the consumer (Corones, 2011). The Fair Trading Act 1987 contains similar provisions with regards to misleading and deceptive conduct of businesses. The provisions of these acts have the objective of consumer protection so that the businesses are prevented from harming the consumer. Remedies under these acts include fines and damages. If a consumer has suffered damage or a loss due to deceptive or misleading conduct by a business, then such a consumer is entitled to damages in the form of monetary compensation. Here, Hugh falsely advertised that they were using UberPizzaDelivery when he was using his son’s services and not of UberPizzaDelivery. So, Hugh was misleading his customers. To draw this analysis a reference has to be made to cases like Dib Group Pty Ltd v Ventouris Enterprises Pty Ltd  NSWCA 300 (21 September 2011) and Beach Petroleum Nl and Claremont Petroleum Nl v Malcolm Keith Johnson and Others  FCA 283; (1993) 115 ALR 411 (1993) 11 ACSR 103 (1993) 43 FC (10 June 1993) which are leading cases in misleading and deceptive conduct of a business. Also, Hugh falsely advertised that in his business only fresh ingredients are used, whereas, in reality, he was using old and out of date cheeses in his pizzas. Here, deception can be clearly established on the basis of famous case laws including Australian Competition and Consumer Commission v Dukemaster Pty Ltd (ACN 050 275 226)  FCA 682 (24 June 2009); Caffey -v- Leatt­hayter [No 3]  WASC 348 (18 October 2013). This was also established in the case of Australian Competition and Consumer Commission v Coles Supermarkets Australia Pty Limited  FCA 634 (Burrows, 2014). As per the Food Act 2003 (NSW) and FSANZ code, a business had to use fresh ingredients which are safe for human consumption. The definition of food (Section 6), unsafe food (Section 8) and unsuitable food (Section 9) has been clearly given in the Food Act (NSW legislation, 2016). The out of date cheese used by Hugh falls under the category of unsuitable food as cheese is a perishable substance as it was used after its reasonable intended use. Section 15 of the Food Act states the penalties when the description of given food is false. The penalties stated in Section 15 are applicable to Hugh as he knew that the cheese was falsely described and that it could result in physical harm. In the case of Bradshaw v McEwans Pty Ltd (1951) 217 ALR 1 at 5, it was stated that to differentiation in criminal and civil proceedings, the facts have to be such so as to eliminate rational hypothesis consistent with innocence. In civil proceedings only plausible inference in favor of what is alleged has to be made. Presently, where direct proof is not available, it is enough if the circumstances appearing in evidence give rise to a reasonable and definite inference. Here, Hugh would not be liable for criminal proceedings as there is no direct proof to the fact that he actually knew someone could die. These principles were also applied in the recent case of Samaan bht Samaan v Kentucky Fried Chicken Pty Ltd  NSWSC 381 (White and Latta, 2015). In the given case, eating such unsafe pizza caused sickness amongst various customers and even resulted in the death of one customer. These parties, along with the heir of the dead person can sue Hugh for serious offence committed by Hugh. Division 1 of the Food Act through its sections states the penalties in form of penalty units and imprisonment. It is up to the discretion of the court to award the necessary penalty in this case. Hugh misled the consumers by stating that they were still using services of UberEats. This gives UberEats the right to sue Hugh for misrepresentation. The contract of service between UberEats and Hugh ended when Hugh started using his son delivery. The name of a business can only be used by the other party if a license in this regard has been provided by the owner of business name. Further, the competition and consumer act prohibits a business from misusing the name of other business as it misleads customers and is deceptive in nature. So, UberEats can sue Hugh for the irreparable damages caused to their business. So it can be concluded that, the conduct was deceptive and misleading and led to infringement of the Australian Consumer Law and other relevant laws. And since, such damage or loss was caused by the conduct than the court may award compensatory order or injunction or orders for corrective advertising to UberEats and sick parties along with heir of the dead person. Coorey, A. (2015) Australian Consumer Law. Australia: LexisNexis Butterworths. Corones, S.G. (2011) The Australian Consumer Law. Rozelle, NSW: Thomson Reuters (Professional) Australia. 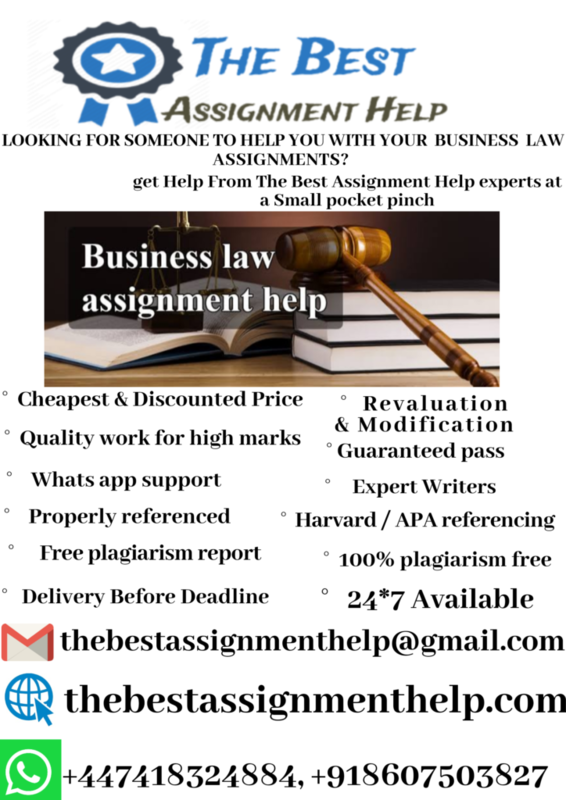 thebestassignmenthelp.com strives towards providing exceptional essay help at an affordable price. Students, from various parts of Australia, prefer our servicers because we provide high-quality essay assistance at a pocket-friendly price. We receive numerous requests ‘help me do my essay‘ or ‘can someone write my essay’ from students every day. We efficiently fulfill those requests and provide students needed essay writing help art an affordable price.